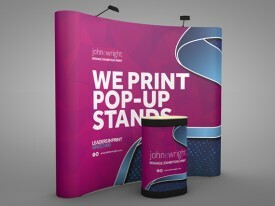 This popular mid-range exhibition display pop-up has self-locating 'smart' magnetic locking arms and mag bars and adjustable clip-on graphic hanger fittings. The price includes the printing of the panels onto 300micron stop light film and finished with a scratch resistant laminate. Magnetic tape, headers and kickers applied. The price also includes the wheelie case, 2 no. Halogen Lights, and a table top as well as the basic frame. The price does not include artwork. If you want us to produce the final artwork then call us on 0115 895 0118.